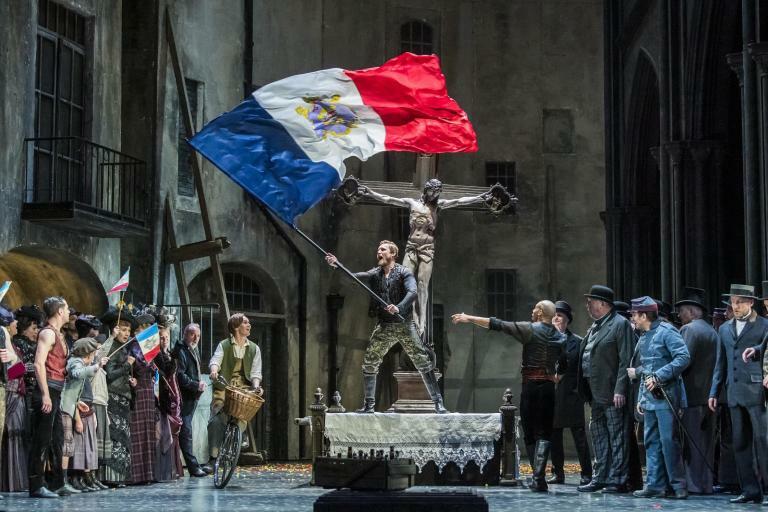 Infrequently performed in the United States, Jules Massenet’s 1910 Don Quichotte is the best-known of several operatic adaptations of Cervantes’s Don Quixote. As familiar as the novel may be, Henri Cain’s libretto (based on Jacques Le Lorrain’s 1904 verse drama) focuses on the infatuation between Don Quixote and Dulcinée—the latter no longer Cervantes’s vulgar Aldonza idealized, but a noble woman sought by a number of suitors. The music is in a rich, late-Romantic idiom Massenet used both to evoke the past and to bring out the passion that has a tragic results. In the Chicago Lyric Opera debut of San Diego Opera’s production of Massenet’s score, a uniformly excellent cast delivered the work effectively. In the title role, Ferruccio Furlanetto gave a vivid reading by expressively using his range and technique. His rich tones evoked his memorable Boris Godunov several seasons ago—very different from his frail Quichotte, especially in the vocally intense final scene of Act IV, in which Dulcinée spurns him. Clémentine Margaine was a revelation as Dulcinée. Margaine’s sonorous mezzo-soprano was evident from the start as she delivered the florid lines of her opening aria with clarity and evenness. She boasts rich tone and a wide range, and her technique suggests a performer to watch as she commands increasingly prominent roles at opera houses around the world. Following this stunner, she was even more impressive in the fourth act, where her languid cavatina transformed into a spirited cabaletta. In the final act, Margaine deftly capped the performance with her ringing voice accompanying the death scene. As Sancho Panza, tenor Nicola Alaimo was engaging in the comic passages, which benefitted from his well-considered body language and comfortable stage presence. He also delivered the patter-song passages with clarity and used an impressive legato, especially in the later acts. At the end of Act IV, he matched Furlanetto well in duets interspersed in the score, and commanded the stage with aplomb when he confronted the mocking crowd. The chorus played a strong role, with Michael Black’s hand evident in the exquisite delivery of the Act I and Act IV set pieces. Their lively evocation of the crowd was first rate, and their polished sound filled the Civic Opera House. Lyric’s orchestra also gave a rich and fervent performance, especially in the opening overture. In the final act, the instrumental interlude has the power of Massenet’s famous “Meditation” in the opera Thaïs, and here the solo cello part was memorable. Sir Andrew Davis’s leadership and elegance were evident, and the imaginative San Diego production had complementary visual dignity and style.